1. 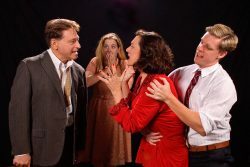 ‘Who’s Afraid of Virginia Woolf?’ at Colonial Players of Annapolis. 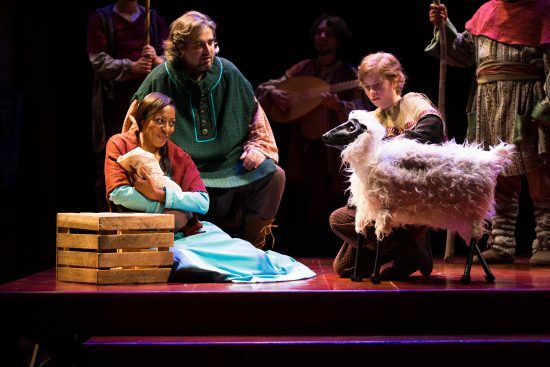 Joseph Mariano (George), Sarah Wade (Honey), Debbie Barber-Eaton (Martha), and Ron Giddings (Nick). Photo by Colburn Images. 2. ‘Hairspray: In Concert’ with BSO and John Waters at Strathmore and Meyerhoff. 3. 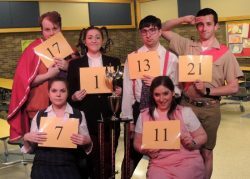 ‘The 25th Annual Putnam County Spelling Bee’ at Way Off Broadway Dinner Theatre. Back row: Jordan B. Stocksdale (Leaf), Alex Levenson (Logainee), Thomas Stratton (William), Joseph Waeyaert (Chip). Front row: Sarah Burton (Marcy), and Tori Weaver (Olive). Photo courtesy of the production. 4. ‘The Sleeping Beauty’ by Ballet Theatre of Maryland at Maryland Hall for the Creative Arts. ‘The Sleeping Beauty’ at Ballet Theatre of Maryland. Photo by Nick Eckert. 5. ‘The Other Place’ at Rep Stage. Maggie Robertson (The Woman) and Julie-Ann Elliott (Juliana). Photo by Katie Simmons-Barth. 6. 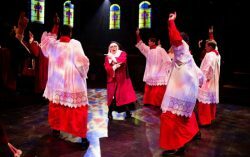 ‘Sister Act’ at Toby’s Dinner Theatre. READ review by Pamela Steinik. Lynne Sigler (center) as Sister Mary Lazarus and the altar boys in Sister Act at Toby’s Dinner Theatre. Photo by Jeri Tidwell Photography. 7. ‘Moxie: A Happenstance Vaudeville’ by Happenstance Theater at Round House Theatre. 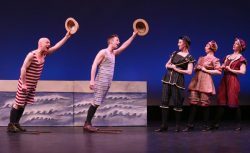 Mark Jaster, Alex Vernon, Sarah Olmsted Thomas, Sabrina Mandell, and Gwen Grastorf in MOXIE: A Happenstance Vaudeville by Happenstance Theater. Photo by Cheyenne Michaels. 8. 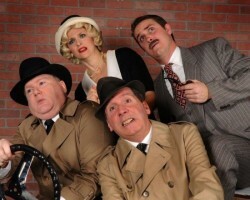 ‘The 39 Steps’ at Dundalk Community Theatre. Tatiana Dalton, Charlie Lidard, Patrick Martyn and Toby Hessenauer in ‘The 39 Steps’ at DCT. Photo by Tom Lauer. 9. ‘Young Frankenstein’ by Silhouette Stages. 10. Agne G in ‘A Night to Remember’ at The Scottish Rite Temple Auditorium. 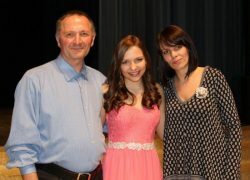 Agne Giedraityte at the concert, surrounded by her proud parents. 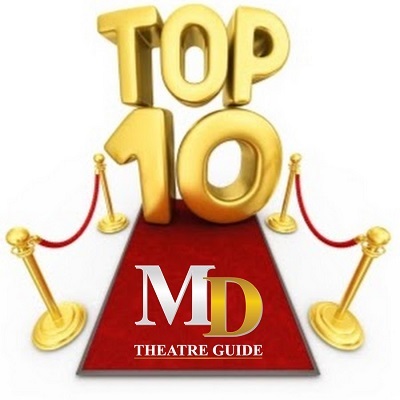 Mark Beachy is the founder and publisher of the MD Theatre Guide. Before starting the MD Theatre Guide, Beachy was a theatre professional. On stage, film, and TV, he enjoyed a career in acting, singing, dancing, violin, figure skating, and even magic. Behind the scenes, Beachy has been a producer, director, choreographer, and an award-winning playwright/composer of seven musicals. His true passion lies with the performing arts, no matter what role he may play on and off the stage. Through the MD Theatre Guide, he brings awareness to the areas up-and-coming performing arts productions.